If there was no prehistoric world, then how did the earth end up void and darkened? The Bible says that God's Word NEVER returns unto Him void. Isaiah 55:11, “So shall my word be that goeth forth out of my mouth: it shall not return unto me void, but it shall accomplish that which I please, and it shall prosper in the thing whereto I sent it.” God made man upright. God made the angels and Lucifer upright. Sin ruined them. Throughout Genesis 1 we read repeatedly that everything God made was “very good.” So why would God make a void and empty frozen wasteland? Clearly something happened. Jeremiah 4:23-28 tells us that God in His anger made the earth void. The Bible mentions over 200 different animals and yet not one mention is made of any of the hundreds of prehistoric species in museums today. Surely if sabertooths, mammoths, dinosaurs (tyrannosauruses, brontosauruses, stegosaurus, et cetera), pterodactyls and hundreds of other prehistoric and terrifying creatures had lived amongst men, they would have been mentioned in the Bible. Clearly these creatures lived in a time before time. The Bible says that Adam named “every living creature” (Genesis 2:19), but modern scientists have named 1047 different species of dinosaurs as of September 17, 2008. Adam couldn't name the dinosaurs (a term that didn't exist until the 19th century) because they were not there, that is, dinosaurs weren't a part of the remodeling of God's creation. You can trace the name of every animal and bird back through history, but dinosaurs you cannot. Where did Satan come from? Clearly he was already in the Garden of Eden, so he existed before man. When did the angels fall? There is no Biblical record of the angels falling during Old Testament times, so clearly they must have been cast down to earth for their rebellion BEFORE Genesis 1:2. When did God cast angels into Hell? 2nd Peter 2:4 says that God cast some of the angels that sinned down to Hell (Tartarus, only mentioned once in the New Testament, a special place in Hell just for demons). The logical conclusion is that God cast the angels down BEFORE Genesis 1:2. In view of Jeremiah 4:23-28, when did God in His fury destroy the cities of the earth? The Bible tells us, that is, after Genesis 1:1 but before Genesis 1:2. In view of Jeremiah 4:23-28, when did God make the earth dark without light to shine? Again, the Bible tells us, that is, after Genesis 1:1 but before Genesis 1:2. In view of Jeremiah 4:23-28, when was there NO MAN? Clearly this passage of Scripture refers to a time before mankind existed. Although some scholars would argue that this passage doesn't specifically say it refers to creation, I think it would be irresponsible to ignore Jeremiah 4:23 and 26, “I beheld the earth, and, lo, it was without form, and void; and the heavens, and they had no light. ... I beheld, and, lo, the fruitful place was a wilderness, and all the cities thereof were broken down at the presence of the LORD, and by his fierce anger.” There is no other way to conclude this passage, except as concerning the origins of the world. At no time in history has it been dark upon the earth as Jeremiah 4:23-28 says, except between Genesis 1:1 and 1:2. In Genesis chapter 1, why does the Bible make a distinction between the word “create” (meaning absolute creation) and the word “made” (which means “to make” in the broadest sense of the word)? Clearly something different was going on. God absolutely created the universe, then made it void in His anger, then remodeled the universe in Genesis 1-2. This is not progressive creation as some call it. God created life as we know it 6,000 years ago, but the universe is millions (if not billions) of years old. A young earth cannot explain any of these things. When did dinosaurs live? There's no Biblical evidence to show that dinosaurs co-existed with man. The word “behemoth” in Job 40:15 (which some ignorantly allege to be a dinosaur) in the Hebrew is plural, referring to more than one creature. The word refers to a herd of animals. I've researched to see what genuine Bible scholars believe concerning this passage of Scripture, and they are divided between an elephant or a hippopotamus; but none thought it was a dinosaur. Most young-earthers claim that legends of flying fire-breathing dragons is proof of dinosaurs, but historians have never verified nor even spoken of such creatures (which are as real as Greek mythology). A young earth rejects legitimate scientific evidence. 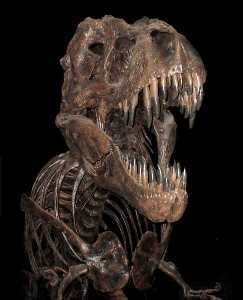 There is plenty of fossil and carbon dating evidence to show that dinosaurs lived 65-220 million years ago. The skeletal remains themselves of thousands of dinosaurs are clear evidence that dinosaurs lived long, long, ago before mankind was created. Numerous scientific methods are used to determine the age of bones and soil. The claim of a young earth laughs in the face of legitimate science. Granted, evolution is based upon bad science and fraudulent claims, which is quite the contrary to proven methods of testing the age of materials. Although scientists may not be able to determine whether the earth is hundreds-of-millions verses billions of years old, they certainly can very easily prove that the earth is much older than 6,000 years. In Isaiah 14:12-14 Lucifer said he wanted to rise above the clouds to be equal with God. When was Lucifer below the clouds? I believe this logically explains why God destroyed the earth, that is, to punish Lucifer. Psalms 102:25 says “Of old” God laid the foundation of the earth. David penned this around 1,000 BC. Is radioactive carbon dating that wrong? I read an article today which tried to prove a young earth, saying that newly formed lava rocks tested to be millions of years old (they were mocking the claim). Of course they did, the old rock turned to liquid and back to rock. It is millions of years old! Melting ice to water doesn't change it's chemical composition. Where did sin originate? Clearly sin did not originate in the Garden of Eden. God gave man dominion over the earth. A young earth would mean that all the dinosaurs and gigantic and ferocious prehistoric mammals (like huge Sabertooth tigers, Mastodons and mammoths) lived amongst men. People would have been dinner! It is quite obvious that these beautiful but frightening creatures did not live with mankind. Clearly they are prehistoric creatures. The pterodactyls (gigantic reptile birds) would have been a major threat to humans, and certainly the Bible would have mentioned these creatures if they existed in the Old Testament. In Genesis 6:19 God told Noah, “And of every living thing of all flesh, two of every sort shalt thou bring into the ark, to keep them alive with thee; they shall be male and female.” The Bible doesn't exclude dinosaurs as some foolish scholars claim. If you believe in a young earth, and that dinosaurs lived amongst men, then you can only foolishly conclude that Noah left them behind as excess baggage (or even more insane, brought them onto the ark). According to public spokesmen, Evangelist Ken Ham's new $73,000,000 Noah's Ark Theme Park in Kentucky will have dinosaurs aboard the ark. That's laughable! Clearly dinosaurs didn't exist during Noah's time. Noah couldn't have fit dinosaurs on the ark if he had tried. Dr. Henry Morris III teaches that Noah brought baby dinosaurs with stunted growth aboard the ark. Seriously? God didn't tell Noah to leave behind certain living flesh; but rather, commanded Noah to bring two of every sort of all flesh into the ark. This is further evidence of an old earth. 132 times throughout the Old Testament we find mention of the lion. In many cases the lion is mentioned as a symbol of strength and ferocity. Job 4:10, “The roaring of the lion, and the voice of the fierce lion, and the teeth of the young lions, are broken.” Proverbs 19:12, “The king's wrath is as the roaring of a lion.” The Bible even says in plain language that the lion is the strongest among beasts. Proverbs 30:30, “A lion which is strongest among beasts, and turneth not away for any.” Surely if tyrannosauruses had dwelt amongst men, then they would have been the strongest among beasts and mentioned instead of lions. No lion would be a match for a Velociraptor, one of the most aggressive and predatory of the dinosaurs. 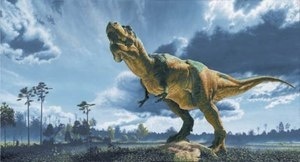 T-rex were meat eaters, but likely scavengers; not hunters like the Velociraptor. The Bible teaches that God created Hell for the Devil and his angels. This means Hell existed before man. Matthew 25:41, “Then shall he say also unto them on the left hand, Depart from me, ye cursed, into everlasting fire, prepared for the devil and his angels.” Hell had to exist before the Garden of Eden because Lucifer and his angels had already rebelled and been cast down from Heaven. The Bible evidences that Cain was never saved (Genesis 4:4-5). God gave Cain the opportunity to repent (Genesis 4:7), but instead of believing the Gospel, Cain murdered Abel. I haven't found any indication of whether Adam and Eve were saved, but we know God rejected Adam's fig-leaf religion and slew a innocent animal instead to provide skins of clothing for them, thus picturing the Lamb of God Who paid for the world's sins at Calvary. If the universe didn't exist prior to 6,000 years ago when the 6-day creation took place, then when and where was Hell created? The Bible strongly evidences that Hell is inside the earth. Every reference to Hell is down into the earth. Proverbs 15:24, “The way of life is above to the wise, that he may depart from hell beneath.” Psalms 55:15, “Let death seize upon them, and let them go down quick into hell: for wickedness is in their dwellings, and among them.” Ezekiel 31:17: “They also went down into hell with him unto them that be slain with the sword; and they that were his arm, that dwelt under his shadow in the midst of the heathen.” And there are many other references. If the earth didn't exist prior to man, then Hell could not possible be in the earth, because 1st Peter 2:4 says God cast some of the demons down into Hell (Tartarus). There are three Greek words for our English word Hell: Hades, Tartarus and Gehenna. I think it is clear that they are all within the earth. The Bible wouldn't say down if it weren't so. Jesus plainly said in John 14:2, “In my Father's house are many mansions: if it were not so, I would have told you.” God said what He meant, and meant what He said. It is not even plausible to believe that 1047 different species of dinosaurs ALL JUST DIED OFF! I mean, 'com on, do you really expect me to believe that all those different species just died off during Old Testament times, while everything living today survived? Furthermore, there were thousands of Prehistoric Mammals and other living creatures. And you expect me to believe that THEY ALL JUST DIED? They are all listed as “PREHISTORIC” because they have never been recorded as existing during human history! That's because they lived before mankind, but were all destroyed in a pre-Adamic world when God destroyed the earth as it was then. And then we read that God began remodeling creation in Genesis 1:2. To adhere to a Young Earth theological position means that the thousands of species of dinosaurs and prehistoric mammals all had to die off sometime in the Old Testament (which began approximately 4004 BC). It would be ridiculous to claim that they died in the flood of Noah's day, when God plainly told Noah to bring two of every animal onto the ark. What would have been the reason for leaving thousands of species behind to die off and become extinct? What would have been the criteria for choosing who stays and who swims? Hey you, you're too big to fit in the ark, get out! It would also seem insane that Adam would name every living creature just to watch many of them die off in his lifetime. I don't believe for one minute that Noah brought dinosaurs aboard the ark, not even so that the tyrannosauruses could look at the menu first. Seriously, thousands of prehistoric animals weren't left behind to perish in the flood of Noah's time. That just doesn't make sense at all. The only logical conclusion is that dinosaurs and prehistoric mammals lived millions of years ago, long before the human race began. These are 21 proofs I have thought up off the top of my head why a young earth is not possible. I'm sure there are hundreds more. The Bible, common sense, science, archaeology, paleontology and history all testify of an old earth. Contrary to the young-earth gang who have no Scriptural support for their heresies, the Bible contains MUCH evidence of an old earth. For example: Satan was already in the Garden of Eden. The Bible plainly tells us in Isaiah 14:12-14 that Lucifer was cast down and desired to be above the clouds, equal with God. Thus, he must have been below the clouds when he said that, that is, upon the earth. The life of Job happened during the same time as Genesis (but that's a different Bible study) Job 1:6-7, “Now there was a day when the sons of God came to present themselves before the LORD, and Satan came also among them. And the LORD said unto Satan, Whence comest thou? Then Satan answered the LORD, and said, From going to and fro in the earth, and from walking up and down in it.” Here we learn that Satan travels not only vertically, but also horizontally through the earth. I don't believe that Satan is restricted to the earth. Ephesians 2:2 calls Satan the prince of the power of THE AIR, but I believe that Satan as a spirit also has the capability to descend into the earth. Revelation 17:8, “The beast that thou sawest was, and is not; and shall ascend out of the bottomless pit, and go into perdition...” In order for the Beast to “ascend” out of the bottomless pit it must first be in the pit. Clearly sin and Satan were already present in the Garden of Eden. Satan sinned before Eve, and Eve sinned before Adam, and when Adam sinned it brought sin and death into the world (Romans 5:12). Young-earthers say that sin couldn't have existed before Adam, but Eve sinned first did she not? Yes, she certainly did sin first. And Satan sinned before Eve by attempting to lead her into sin against God. Of course, Lucifer had previously sinned against God by attempting to be equal with God (the same sin of feminists today). Lucifer became Satan, the accuser of the brethren. This all happened BEFORE Genesis 1:2. God created the universe in Genesis 1:1, but a cataclysmic event made the earth void. Jeremiah 4:23-28 plainly teaches that God in His wrath laid the earth to ruin, destroying the cities thereof and blackening the stars. In Genesis 1-2 God remodeled the universe and made it as we know today. This in no way negates nor rejects a literal six-day creation as the Bible teaches. I DON'T believe in theistic evolution, nor in progression creationism. I believe that God created the universe billions of years ago, before mankind every existed. Nothing evolved. God destroyed the pleasantness of the earth, shaking the mountains and laying the earth waste, turning it into a frozen wasteland of void and darkness. Isaiah 55:11 says that God's Word NEVER, NEVER, NEVER returns unto Him void, failing to accomplish that which He has spoken. God created man upright. God created the angels and Lucifer upright. Sin ruined them. Everything God made in Genesis 1:2-2:25 was not just good, but “very good.” Yet how did the earth become void, without form and dark in Genesis 1:2? Clearly there was a cataclysmic event between Genesis 1:1 and 1:2. To deny an old earth is to totally reject all these Scriptures and truths. God never calls us to blind faith. We have every reason in the Scriptures to place our faith in God our Savior, Jesus Christ. The Bible never contradicts legitimate science, and legitimate science never contradicts the Bible. A young earth view must be accepted on blind faith, because there is no evidence to support it. So young-earthers pervert the facts, falsely accusing old-earthers of being evolutionists in order to demonize them, and desperately grasp for straws in a futile attempt to prove their heresies. If you take the Bible at face value, you can only conclude an old earth. Beware Of Ken Ham's Dinosaurs In Eden Scam!!! after the tradition of men, after the rudiments of the world, and not after Christ."